I have a rule. If three separate people suggest something to me, I think of it as a divine message. I didn’t read Pride and Prejudice until seven years ago because it was referenced by three different people in a short time span. It’s now easily my favorite book. 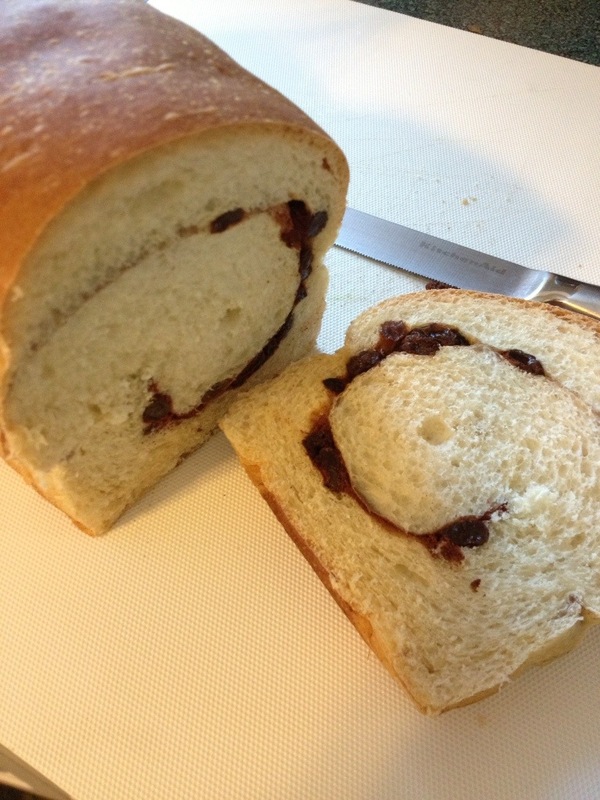 The first time I heard about Knead The Dough in Ransomville, New York my friend Dorothy mentioned their cinnamon raisin bread. The second time is fuzzy and the third time was by my friend Mary who told me that my love for restaurant tables being set differently was common practice at this breakfast and lunch place just seven miles from our home. I confess, I love breakfast. I always have. I loved nights when my mom would make us breakfast for dinner. She had the touch with everything and a perfectly seasoned cast iron skillet to make crisp on the outside, soft on the inside home fries. By the way, home fries or hash browns? Home fries everyday of the week for me…and twice on Sunday! 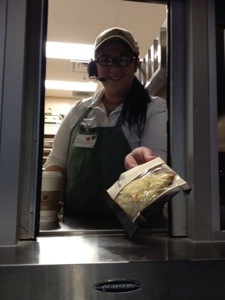 Jody, our server, recommended the Ransom Scramble when I asked what her most popular breakfast was. 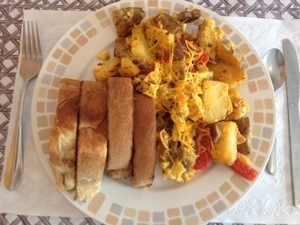 The home fries and scrambled eggs come with cheddar cheese and I chose to add sausage and roasted red peppers. It was a bite that brought me back to mom’s cast iron skillet dinner. It comes with toast and there were many varieties with wheat, white and cinnamon raisin baked in house. I chose the fresh butter slathered cinnamon raisin bread. 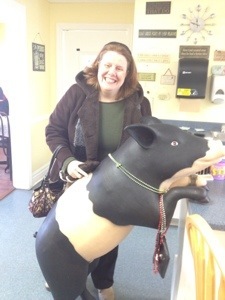 Oh wait, now I remember the third person who suggested Knead The Dough…it was my friend Kim, pictured here with Savannah, the antique pig decked out with more bling than a three year old playing dress up. She used to teach down the road and loved to come in for the egg salad. 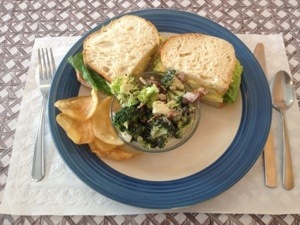 She had it on untoasted Italian bread and the chucks of egg squished out at every bite, just like good egg salad should. I’ve always loved eating the rest of my sandwich with a fork. Kim and I enjoyed our food so much we barely spoke. If you know us you may think you witnessed another miracle at Lourdes. 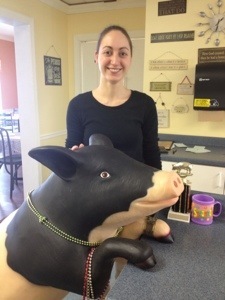 The staff and owner are the nicest folks you will ever meet. 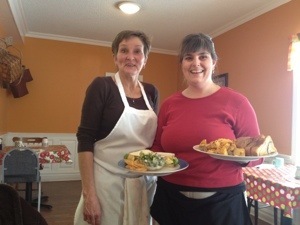 Patty, the owner and Jody are pictured here with their delicious plates. I think this is Jessica but I was so enraptured when she spoke I stopped being a food writer and began being a fan without a pad of paper. The people that work there are either great actors or really love the place. The people that eat there were either coincidental props or happy patrons. As for me, I was able to spend some time with a dear friend with whom I share a love for singing and writing and meet some new people who wanted to feed me. That combo plate was as good as it gets. Is it me or is that bread smiling at me? Yes or no does not matter because I could only smile back. I was driving from Western New York down to South Florida the other day when I spontaneously got off Interstate 95 (once saw a tee-shirt that said “I drove I95 and I survived”)onto I16 for Savannah Georgia. My intention was to drive in and walk around. 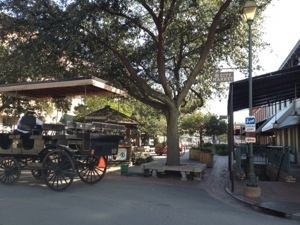 The folks at Old Town Trolley Tours had their own idea when they waved their paddles wildly at my car and my friend Loretta’s advise to take a trolley rang in my head. Great call, Loretta! Whenever I visit a town new to me I pose the same question: what is the one bite I should get if I never get back? 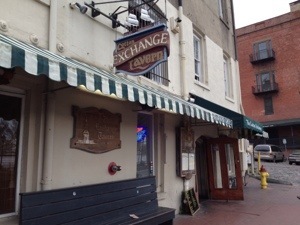 She said shrimp and grits at the Cotton Exchange (trolley stop 11) and a lady on the tour also said Leopold’s for ice cream (trolley stop 8). It was here I met Zach at Savannah’s Candy Kitchen. He was my first tasting buddy of the day. I asked about a candy I had always known as Turtles and he politely corrected my by describing them as Gophers. You cannot know how happy I was the day I discovered I’m not allergic to pecans…I did not taste them in Savannah and chose to bring them with me for the ride. They are a treat to behold. I walked around that square taking in the local color including Paula Deen‘s Lady and Sons restaurant but chose to take the recommendation of the locals. What a woman, that Paula Deen! She has a retail space connected to the restaurant that reminds me of the are you enter after you get off an attraction at Disney World. I hopped back onto the trolley and saw the home of Juliette Low, the founder of the Girl Scouts. I was only slightly disappointed the home was a creamy beige and not a soft green I imagined from my old uniform. The trolley drivers are very informative, each with their own brand of shtick. I did get busted once for talking but, in my own defense, I was only answering someone’s question. 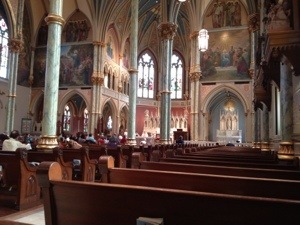 My next stop was number 6, to see the Cathedral of St. John the Baptist. It is a very beautiful church and well worth the stop. 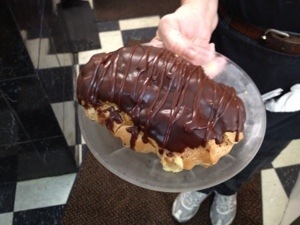 After visiting the church I walked across Lafayette Square to Clary’s, famous for its role in a movie called Midnight in The Garden of Good and Evil and for their eclairs as big as my head. It was delicious (I had about a quarter of it this morning as breakfast-glad I had a cooler with me). 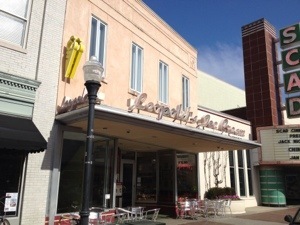 Back on for a few stops and jumped off at stop #8 for their famous soda bar called Leopold’s. My tour guide said it was voted best ice cream in the south…the country…the world! Wow, I felt like Buddy in Elf and just wanted to go in and congratulate them. Worlds best? Fabulous!! I ordered the Lemon Custard and found it to be very smooth and almost buttery. There was a hint of lemon peel in it and I ate a good deal of my single scoop. I originally set out to stay for three hours and get three good bites. 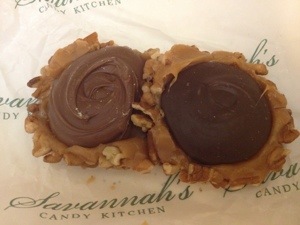 By this time three hours had passed and I had already eaten or purchased for later enjoyment pecan pralines, peanut brittle, milk chocolate and dark chocolate gophers, a ginormous eclair and world famous ice cream. But what the heck…the seven hour drive down to South Florida could wait a few more hours! I enjoyed meeting up with the same folks who began the tour with me. They were really nice and they expressed both shock and awe at the fact I was doing this alone, sandwiched into my 22 hour drive. If any of you are reading this, please let me know. Did you go back for the shrimp and grits? Well, back on the trolley for me, this time getting off at stop number 11, Bay Street. 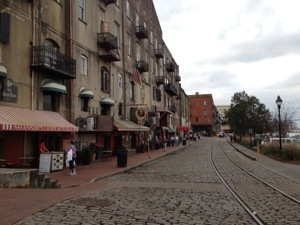 The end of this cobblestone street was the Cotton Exchange. 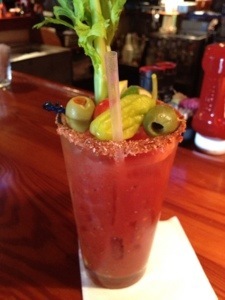 Here is my new best friend Brandon, as fine a mixologist as you will find, serving me a most beautiful Bloody Mary. And, it was as tasty as it looked. Even the salty seasoning on the glass rim was pretty. The Absolute Peppar gave it a kick without being too spicy. I enjoyed the slight kick from this creamy chowder with corn and potatoes. He also brought over a tasting of German Potato Salad, different from the warm version I am used to. It is a red skin potato salad made with celery, mayonnaise and sour cream. Then it struck me…that’s my mother-in-law’s recipe…raised by a German couple…wow! My journey was almost over. It was only me and the shrimp and grits. The big taste was everything it was built up to be and more. The first surprise were the grits. I was expecting a creamy polenta like mixture. Instead they were more like a creamy biscuit shaped disk. The menu describes the dish as a bowl of organic stone ground grits lightly fried topped with roasted red peppers, onions, jumbo shrimp, andouille sausage (delicious all on their own) and smothered in a sherry cream sauce. 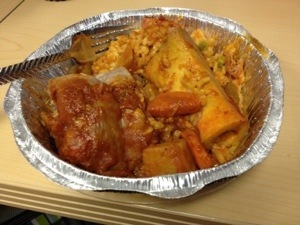 I will remember this dish for a long time. It was the perfect balance of cream and heat. This five and a half hour tasting was a most welcome diversion in a long and boring trip south. Best of all? I have some leftover shrimp and grits in my refrigerator right now! Think chi coffee…the jury is still out but on first sip…meh! 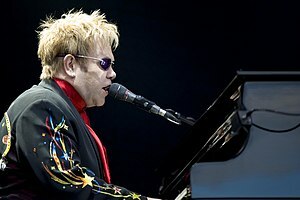 Elton John’s “Your Song” – Who Would Mind? And I thought, who would mind? Doesn’t everyone want to hear they are valued, treasured even? Today is often a day of reflection and this girl is no different. Looking back on 2012 it was an anything but typical year. There were great beginnings and sad endings. Our son graduated from college, passed the CPA exam and began a job in NYC at a Big 4 accounting firm. Heck, I think they still call it that…it was the Big 8 when I was in college…who knows? My mother-in-law passed away just days before our son moved away. And, that’s where my connection to the Elton John comes in. In the six months I have been writing my own site I have been overwhelmed by the support and interest you have in my writing. It is clear to me that you all “get” the connection between food and life. I posted a picture on my Jude The Foodie Facebook page of a container of onion dip and pita chips and got hundreds of hits and 34 comments. Imagine that? Please click here and “Like” it so you can also get in on the fun. 2013 is going to bring some exciting beginnings for Jude The Foodie. I’ve cleaned up the categories on the right to make it easier to navigate. We will soon welcome advertisers into our family. In a few short weeks my weekly column will be published on a local news online site every Monday. I will have more information soon. The fun continues because we will have exclusive monthly give-away’s for those online readers. The column will be archived here the following week so you will still be able to find recipes or suggestions of where to dine. I will continue to post “Quick Bites” and “Quick Sips” as I go and we will try to make the content as interactive as possible. I love when you “Like” a post or, even better, post a comment. It is great to know what you are thinking. I’m thinking big. By the end of the year I would like to have 20 local online news organizations from across the country get in on the fun. Heck, why not one in each state? We may not have grown up in the same neighborhood or graduated from the same high school but we all have memories of food and life. Many of you are children of the ’60’s and ’70’s and have similar memories of the sights and smells of your house growing up. My goal is to keep the nostalgic conversation going, whip up some yummy food and get to know you. If you are a WordPress blogger you know following is simple. If not, simply follow my blog via e-mail over there on the right. If you would like your local online news organization to post lively and original food and life columns weekly please feel free to contact me and I will happily make it happen. Meanwhile, thank you again for making Jude The Foodie the success it is. Have a yummy New Year! Enjoyed a wonderful dinner with friends last night at Sinatra’s Restaurant on Kenmore Avenue in Buffalo. I had a particular favorite, Osso Buco Cremolata. The peas in the risotto made it taste like home. The dish was presented with a marrow fork…so I could mine that deliciousness! 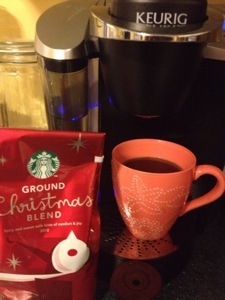 Brewed in my Keurig, Christmas is a quick sip! Much to my delight, Brittany was ready for me. Dark roast with milk. Check. But it’s Saturday! We were biting this morning…we were biting, this morning!